Flatey is an island in northwest Iceland, part of the 40 or so Western Islands located in Breidafjordur Bay. Stretching two kilometres long and just one kilometre wide, the island is mostly flat which is where it gets its name in Icelandic. Inhabited by more sheep than people, and illuminated by the mesmerising Northern Lights, Flatey Island is tranquil and pretty in equal measure, with a singular road carving through its green fields from the ferry terminal to the main village. This dusty route takes you past well-kept houses decorated in pastel colours, large flocks of puffins and arctic terns and absolutely no cars; vehicles must be left at either Stykkisholmur or Brjanslaekur before you embark on the ferry. Hotel Flatey, the only hotel on the island, is only open during summer from June until late August, so it’s best to visit in this period of time. In fact, Flatey Island has seasonal habitation, with a total of just five or so people occupying the island during winter. 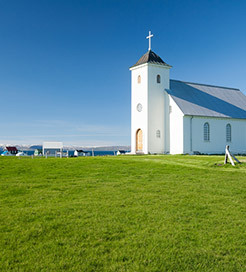 Conversely, Flatey was one of the most densely populated areas in Iceland during the 18th Century, and was dubbed the country’s cultural and artistic hub. In terms of attractions and landmarks, Flatey’s church was built in 1926 with an interior depicting aspects of island life, designed by an artist from Catalan in the 1960s. The island also boasts the smallest library in Iceland, established in the mid-19th Century, which once contained the largest medieval Icelandic manuscript. Getting the ferry to Flatey Island is one of the most scenic routes you can take in Iceland, offering the chance to spot whales, fields of lava and glorious beaches. You can reach the island from two locations: Brjanslaekur, to the north, and Stykkisholmur, to the south, which last 60 and 90 minutes, respectively. These routes are operated by one of the country’s leading tourist ferry companies, Seatours, so you’re guaranteed an enjoyable trip. For more information, please visit our Ferries from Iceland to Flatey Island page.